This genius made such beautiful and perfect wooden putters that he has come to be regarded as the Amati or Stradivarius of Golf, and a genuine "Philp" today is worth untold gold. The long narrow faces of these clubs and their perfect balance are well known to connoisseurs (Golf Illustrated, 5 Oct. 1900: 12). It was Hugh Philp who first departed from the primitive models of the stone age and began to make golf clubs that looked as though they were intended for some gentler work than the crushing in of an enemy's skull or the manufacture of broken flint for road-building. Philp had an eye for graceful lines and curves, and his slim, elegant models remain today things of beauty . . . . Moreover, as any fine crusted golfer will tell you, Philp was the only man who ever knew how to make a perfectly balanced wooden putter. The few specimens that still exist are acknowledged "old masters," and are only to be exchanged against much fine gold (Harper's Weekly, 2 Oct. 1897: 986). Ever since his death in 1856, Hugh Philp has been universally recognized as clubmaking's finest artisan. His clubs have been copied and even forged, complete with his name. Philp's clubs were collectible 100 years ago. During the 1890s, a few people actually advertised in Golf, a weekly periodical, offering to purchase his work at prices well above the cost of any new club. His craftsmanship was often compared to that of legendary and fabled violin maker Antonio Stradivari. Even a few aluminum head putters made in the early 1900s were modeled after Philp's designs. Philp, in the olden times, was in the wont of spending half a day agreeably putting the finishing touches to a club after it had been handed over by his workmen as completed (The Golfer, 3 Nov. 1894: 184). Today, Hugh Philp's legacy continues unabated. He is considered the premier long nose clubmaker. He set the standard by which the work of other clubmakers is measured. Decent examples of his clubs are cherished. The 42-inch long spoon pictured on the facing page measures 5 3/4 inches in head length, 1 7/8 inches in width, and 1 inch in face depth. Formerly owned by the Arbroath Golf Club, in Arbroath, Scotland, this nearly unused example was displayed in their clubhouse for years before being sold, to raise funds, in the early 1980s. Because Hugh Philp's clubs have been highly sought after ever since his death, many examples remain. Approximately 190 are known. The opportunity to obtain a nice Philp is, in many ways, rarer than the club itself. Many examples are held by golf organizations ranging from the R&A and the USGA to such venerable clubs as The Honorable Company of Edinburgh Golfers (Muirfield) in Scotland and the Los Angeles Country Club. The remaining examples are primarily in the hands of serious collectors. Therefore, a Philp in nice condition rarely becomes available. The 42-inch Philp long spoon pictured on this page is one of only five known examples marked "H. Philp" in script. Robert Davidson routinely stamped his clubs in script, and Tom Hood stamped a large percentage of his clubs in script, but Philp stamped only a few of his clubs that way. It is thought that Philp used his script stamp to identify either his personal clubs or the presentation clubs he made for a particular person or occasion. This particular script-stamped clubhead measures 5 1/2 inches long, 2 inches wide, and 1 inch in face depth. Hugh Philp died April 6, 1856, in his seventy-fourth year. He served no apprenticeship to club-making, but was bred to the trade of joiner and house carpenter. He carried on that business in Argyle Street, St. Andrews; and as there were no club makers in St. Andrews at that time, the golfers began to take their clubs to him to be repaired; and after a time they got him to come down to the links where he had a shop where the Grand Hotel is now built. That would be somewhere between 1820 and 1825 [during September of 1819 Philp was appointed official clubmaker to the Society of Golfers at St. Andrews]. Some few years after that he bought the property now occupied by Tom Morris, where he died in 1856. I don't know where he was born, nor how long he made clubs, but I have heard him say that he made them for over fifty years. I was his assistant when he died-his former assistant having left him in 1852 and opened a club maker's shop on the ground where the Marine Hotel is now built. His name was James Wilson, and was twenty- three years Mr. Philp's assistant. [Andrew Strath was also an apprentice to Philp (Tulloch 1908, 22).] I was four years Mr. Philp's assistant, and I succeeded to the business which is now carried on under the name of R. Forgan and Son (Golf, 3 Feb. 1899: 412). Could the past be relived, you might enter Hugh's shop with me; as it is, do so in fancy. It is not a very commodious habitation, being a small square box erected on the convenient brink of the course at the commencement of the links. Round the walls are ranged boxes filled with finished clubs for the golfer to choose from; piles of embryo handles and heads, and quantities of doubtful material, yet undeveloped, strew the ground; overhead are horizontal racks of clubs belonging to some of Hugh's customers, who claim a kind of prescriptive right to keep their sets in his shop; and in one corner is Hugh's own particular bench. The shop is evidently a place where golfers of all descriptions . . . congregate; caddies waiting engagements, gentlemen players smoking their pipes, chatting with Hugh, or selecting their clubs. Hugh himself is polishing and stamping his name on some clubheads. For many and many a year to come these letters which he is branding on the clubs will serve for Hugh's best epitaph, and golfers yet to be will sigh for the 'touch of that vanished hand' which fashioned so deftly and so well. He is clad in his invariable snuff-colored garb, and his silver-rimmed spectacles are pushed upward on his brow. His keen black eye is glittering with the fun of some golfing story he has been relating to a group of players. Hugh had plenty of these tales, and told them with a dry comicality which was irresistible. But you should have seen Hugh play a match. As a rule, he did not much care about leaving his shop to play regular matches with gentlemen golfers, but occasionally took a round when the chances were a little in his favour. Hugh thoroughly understood both the etiquette and saving policy of the game, and never if possible took his match before the burn hole, which left only one hole more to play. He could, therefore, with every degree of plausibility, solace his beaten opponent with the idea that it was a very, very close match-indeed, that there was no saying how the next might go. . . . (Golfing, 16 Nov.: 24). The exquisite Philp putter pictured here was once part of an unused set of nine Philp clubs presented by Sir Hew Dalrymple, Bart., of Luchie, to John E. Laidlay, a two-time British Amateur Champion and runner-up in the 1893 British Open. Recognized as a one of a kind, Laidlay's set of nine Philps was displayed, at the request of the Reverend John Kerr, at the Glasgow International Exhibition of 1901. It was also at Reverend Kerr's suggestion that the archaeology committee of the Glasgow International Exhibition included an exhibit on golf. In return, the committee put Kerr in charge of preparing the display. The Glasgow International Exhibition of 1901 opened in May and ran for six months. To allay the fears of lenders, their golf treasures were housed in an isolated, fireproof structure, lighted throughout by electricity and guarded day and night. (Upon completion of the exhibition, the structure was to remain as a permanent art gallery and museum.) Within this grand building the "Laidlay" Philp clubs were displayed in their own special case. It was recognized, even then, that Laidlay's Philps were of greater significance than the normal relic. In 1981 John Laidlay's set of Philp clubs was broken up-each club was sold individually at a Sotheby's golf auction in London, England. The certificate the Glasgow International Exhibition presented to Laidlay for lending his clubs was auctioned as the lot following the last of the nine Philps. 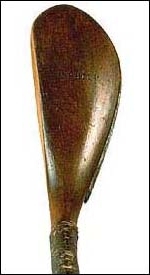 It is believed that Laidlay's Philps were crafted in the early 1850s with the aid of Philp's assistant, Robert Forgan. Such nine club sets were known to be awarded as "prize clubs" to the winner of a competition (see Smith 1867, 11 & 18). Although this putter has never been used, the lead in the back of the head has shifted slightly. This is not an unusual phenomenon and can occasionally be found in other clubs. The head on this Philp putter measures 5 3/4 inches long, 2 1/8 inches wide, and only 15/16 of an inch in face depth.